This is a scalable context timeline. It contains events related to the event November 1, 2004: New York Times Columnist Accuses bin Laden, UN Inspector of Trying to Influence Election in Kerry’s Favor. You can narrow or broaden the context of this timeline by adjusting the zoom level. The lower the scale, the more relevant the items on average will be, while the higher the scale, the less relevant the items, on average, will be. Osama bin Laden sends a letter to al-Qaeda leader Abu Faraj al-Libbi, and US intelligence will learn about this a year or so later. This is one of the very few pieces of evidence known by US intelligence that suggests bin Laden is alive, after bin Laden escaped from Tora Bora, Afghanistan, in late 2001. Al-Libbi has been al-Qaeda’s operational commander since early 2003. Musharraf's 2006 Book - In a 2006 book, Pakistani President Pervez Musharraf will similarly mention that al-Libbi “was in contact with Osama through a courier and the last letter he had received from Osama was sometime in December 2004. We have been looking for the couriers intensely.” [Musharraf, 2006, pp. 172] Al-Libbi will be captured in May 2005, and apparently he is interrogated by Pakistan for a few days, and then turned over and interrogated much more by the US (see May 2, 2005). So different interrogations may explain the slightly different months mentioned in each account. Bin Laden’s courier will later be revealed to be Ibrahim Saeed Ahmed, and the US effort to track him will eventually lead to bin Laden (see May 2, 2011). Roughly around 2004, the CIA suspects that Osama bin Laden has moved from the mountains of Pakistan or Afghanistan to an urban area in Pakistan. Marty Martin leads the CIA’s hunt for bin Laden from 2002 to 2004. After bin Laden’s death in 2011, he will say: “We could see from his videos what his circumstances were. 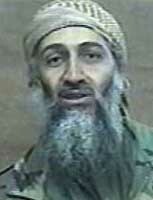 In the immediate years [after bin Laden’s escape from Tora Bora in late 2001] he looked battle fatigued and on the run. He didn’t look healthy. We knew he was moving. But where? We simply didn’t know. Then, he gained weight and looked healthy. I told my analysts, ‘He’s gone urban, moved somewhere stable and safe.’” [ABC News, 5/19/2011] The only publicly known video of bin Laden after December 2001 is one released in October 2004, so Martin presumably is referring to that (see December 26, 2001 and October 29, 2004). 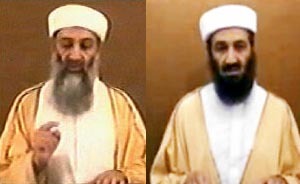 Bin Laden video in 2004, left, and bin Laden video in 2007, right. 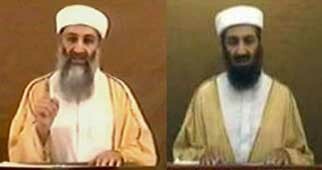 [Source: Al Jazeera (left) and Intelcenter (right)]A man thought to be Osama bin Laden releases a new video message, his first for three years (see October 29, 2004). In the message, which is addressed to the US, the speaker says that actions by radical Islamists have influenced US policy and that American prestige in the world has fallen, even though the interests of radical Islamists “overlap with the interests of the major corporations and also with those of the neoconservatives.” He also criticizes the US media and, due to its treatment of Sunni Muslims, the Iraqi government. The speaker says, “The holocaust of the Jews was carried out by your brethren in the middle of Europe, but had it been closer to our countries, most of the Jews would have been saved by taking refugee with us,” and also references common discrimination against Jews and Muslims in Medieval Spain, pointing out that Jews in Morocco “are alive with us and we have not incinerated them.” In addition, he criticizes the US-led wars in Iraq and Afghanistan, saying that the Democratic party was elected to stop the war, but continues “to agree to the spending of tens of billions to continue the killing and war there,” because “the democratic system permits major corporations to back candidates,” who are then, it is implied, controlled by these corporations. The voice mentions the assassination of former US President John Kennedy and says that “the major corporations who were benefiting” from the Vietnam War “were the primary beneficiary from his killing.” He also references left-leaning writer Noam Chomsky, former CIA bin Laden unit chief Michael Scheuer, global warming, and the Kyoto accord, saying that the democratic system has caused a “massive failure to protect humans and their interests from the greed and avarice of the major corporations and their representatives,” and is “harsher and fiercer than your systems in the Middle Ages.” Finally, the speaker compares US President Bush to former Soviet leader Leonid Brezhnev, who failed to acknowledge the Soviet Union was losing the Afghan War, and calls on the US to get out of Iraq and embrace Islam, which recognizes Mary and Jesus, a “prophet of Allah,” but does not recognize taxation. 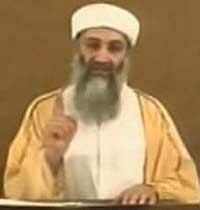 [MSNBC, 9/7/2007 ; Osama bin Laden, 9/7/2007; Osama bin Laden, 9/7/2007; Osama bin Laden, 9/7/2007] Bin Laden’s beard is different to his beard in previous videos and this leads to some discussion. According to the Washington Post, “The tape’s most striking feature [is] bin Laden’s physical appearance: The straggly, gray-streaked whiskers of his previous images [have] been replaced with a neatly trimmed beard of black or dark brown. While some analysts speculated that the beard [is] fake, others said it [is] likely that bin Laden had dyed his beard, as is customary for older men in some Muslim cultures.” [Washington Post, 9/8/2007] There are some problems with the video; for example, the picture is frozen for most of the time and the video is spliced (see September 12, 2007).